I just finished three action-packed days at the CoDev 2010 conference, an international conference on open innovation chaired by Cheryl Perkins, CEO of Innovationedge and thought leader in open innovation (and yes, my boss!). Over 200 attendees gathered to learn and share the latest in collaboration for successful innovation. Outstanding speakers discussed their success stories in bringing companies forward in open innovation, and experienced panelists and seminar instructors provided additional perspectives. The initial keynote speech from Peter Erickson, Senior Vice President of General Mills, set the stage for the conference, inspiring us with what can be achieved in a short time when a corporation is committed to strengthening innovation. He described their steps to implement processes and structures for open innovation, making it a basic part of how they develop new products. They are now able to bring new products to the market more successfully and in less time, with dramatic gains for their open innovation work. Similar stories were told by Procter & Gamble (Chris Thoen and also Kim Zerby), Unilever (Jon Hague), Kraft Foods (Todd Abraham), Alberto Culver (Carlos Linares), and Microsoft (Cliff Reeves), all offering inspiring perspectives of how openness and collaboration have transformed the companies and made them more successful. P&G, for example, now has over 50% of their new products due at least in part to successful collaborative efforts with outside groups. And their Connect & Develop portal for unsolicited submissions has shown a surprisingly high success rate, with about 8% of the submitted concepts becoming part of active projects. In fact, every business unit has active projects that include external concepts that began as unsolicited submissions. P&G provides compelling evidence for the business success that can come from establishing oneself as a good partner for collaboration and from aggressively pursuing open innovation. The Microsoft story also shows dramatic potential and progress coming from their relatively recent cultural revolution that has transformed Microsoft. I also enjoyed the presentation by Todd Abraham of Kraft Food, who showed the results of their pervasive efforts to adopt open innovation. Another important presentation was given by Fabienne Jacquet of Colgate-Palmolive, where the formal effort to pursue aggressive open innovation only began in 2007, but has already demonstrated significant success as outside partners recognize Colgate as a partner who treats entrepreneurs like humans. Part of their success has come from helping internal scientists become closer to the market and to the consumers, something we strongly advocate in Conquering Innovation Fatigue. Colgate is building a healthy ecosystem for innovation. Open innovation isn’t just for giants like Microsoft, Procter, or Kraft. Mike Irwin of WD-40 talked about their journey and growing commitment to open innovation to develop stronger brands and new partnerships. WD-40 has been strengthening their internal culture to find new collaborative approaches for growth. They are putting some serious effort into defining the right partnerships for their future. I also enjoyed learning from experts who shared perspectives from universities and national labs. Cheryl Perkins and I did a daylong pre-conference workshop on scenario planning for innovation, with emphasis on disruptive innovation, alliances, intellectual asset strategy, metrics for success, and secrets to creating the culture, tools, and processes needed for success. Case studies and a variety of exercises kept it lively and fun, thanks to the tremendous group of participants we had. I can provide more information about the content if you’re interested. One of my favorite parts was the team exercise we did with a simulated panel of General Motors leaders listening to pitches crafted by three teams regarding a collaborative opportunity. Really enjoyed learning from the different approaches the teams took and the responses of the GM panel as they considered the opportunity. I can’t wait for next year. Learned so much and met such interesting and capable people. A well organized conference through and through. One of the most interesting patent attorneys on the blogosphere is the inimitable Gene Quinn of IPWatchdog.com. His top five patent stories of 2009 are especially noteworthy. He doesn’t exactly hold back on his opinions about these stories, and for the most part I have to agree. All of these stories fit in with the theme of innovation fatigue in some way. I think the allowance rate, backlog and pendency issues deserve their own place in the top 10 because of the toll that it has had on the US economy, which is inexcusable and darn near treasonous during a recession as bad as anything we have seen since the Great Depression, and perhaps on par with the economic troubles of the late 1970s. To put this into some historical perspective, take a look at the chart [see Quinn’s original article]. You can see that the backlog started its upswing noticeably in 1998, and just went out of control over the last decade. Under the Bush Administration the USPTO held innovation hostage, prevented small businesses, start-ups and entrepreneurs from getting investor funding and that created a drag on the economy, prevented the creation of new jobs and then when widespread economic disaster hit the Patent Office was unable to play a part in recharging the US economy. Ouch! But as an inventor and former Corporate Patent Strategist familiar with the pains and burdens of delay, I can’t bring myself to disagree! As I continue working with inventors, both within corporations and lone inventors or small teams in start-ups, I have seen a great deal of discouragement when people learn just how long it takes to obtain a patent, and just how difficult it has become. Bold, original, brilliant concepts that need intellectual property to better secure investment are held up and may die due to the ever growing backlog and increasing delays from the PTO. If we want to conquer innovation fatigue in the United States, we need to give the U.S. Patent and Trademark Offices the resources it needs to provide rapid examination and swiftly reduce the disastrous backlog in cases. Are we headed in the right direction now? No, I’m afraid not. When our book went to press early in 2009, I expressed relief that past Congressional siphoning of funds from the PTO had ended. Unfortunately, I spoke too soon. What is essentially a tax on innovation came back in the closing days of 2009, as we learn from the nation’s leading investigative reporter on patent topics, John Schmid of the Milwaukee Journal Sentinel. In his story from Dec. 29, 2009, “ Congress Deals Funding Blow to Patent Office: Budget Strips $100 Million Provision for Backlogged Agency,” he shares the disturbing news that Congress has again acted to take money away from this essential and underfunded office. The $1.1 trillion spending bill that Congress passed this month bankrolls thousands of pet projects: the World Food Prize in Iowa, a farmers market in Kentucky, and a 12-mile bike path in Michigan, among many others. And to pay for a fraction of its largesse, Congress added one late change to the budget: It slapped a restrictive spending ceiling on the U.S. Patent and Trademark Office, further cramping an agency that was already incapacitated by more than a decade of congressional raids on its fees. A Journal Sentinel investigation published in August documented how congressional diversions of the agency’s income from 1992 through 2004 left the Patent Office incapable of keeping pace with the volume and complexity of the applications it receives. The backlog has grown to more than 1.2 million applications, which the agency has said could take at least six years to get under control – assuming it receives the funding to hire and train new examiners. But a budgetary provision that could have allowed it to spend up to an additional $100 million during the current fiscal year was stripped on Dec. 9, the final day of budget negotiations. “We are currently operating on a barebones budget that makes it very difficult to attack our application backlog,” said Sharon Barner, the agency’s deputy director. The last-minute move further frustrated critics who say the Patent Office has become dysfunctional because of mismanagement and underfunding. Washington’s policy-makers fail to recognize that innovation – which the Patent Office is designed to encourage and protect – has become the key driver of competitiveness and job creation, said Hank Nothhaft, chief executive of chipmaker Tessera Technologies in San Jose, Calif., and a prominent advocate to repair the years of damage at the Patent Office. Read the full story and let your Congressional representatives know how you feel. This tax on innovation is a terrible step in the wrong direction. We need to be adding fuel to this critical engine of economic growth, not siphoning it out of the gas tank. To conquer innovation fatigue, a healthy and efficient patent system is needed. It’s a valuable idea, one that could really help if done properly. Unfortunately, government programs often have unintended consequences (the bigger the program or policy shift, the bigger the surprise), and any program created and guided by politicians could suffer from political distortions. Could it be done fairly? Is there a risk that money might be misallocated or ultimately diverted from healthy to unhealthy regions of the economy? Crafting an organization that fosters judicious business decisions may not be a reasonable expectation for politicians, so many of whom are unfamiliar with the challenges and rigors of running a business. With the right help and understanding of the challenges and needs innovators face, it could help. But is it solving the right problem? Would there be new unintended negative consequences? The financial barriers to innovation that many entrepreneurs are facing today can, in my opinion, be largely traced to the failures of previous government efforts to help the economy. Even overlooking the role of the Federal Reserve Bank, Fannie Mae, Freddie Mac, Congress, and other government organizations in creating the housing bubble, the present tightness in credit, in spite of all the misallocated billions of bailout money, can be at least partially traced to the artificially low interest rates created by the Federal Reserve Bank, which allows banks to borrow money for almost free and get safe, lucrative returns by investing in treasuries, whereas loans to entrepreneurs are high risk. For one thing, there’s an interesting “carry trade” going on right now that only banks can access. The Federal Reserve set the Federal Funds Rate at around 0%, giving banks an opportunity to borrow at essentially no cost. But 10-year Treasury yields — the typical proxies for mortgages — are around 3.8%. As a result, banks can earn an essentially risk-free 3.8% borrowing from the Fed system and lending to the Treasury, rather than lending to risky borrowers like you and me. That’s easy money if you’re a bank. With the Federal deficit ballooning, the Treasury is certainly offering the banks plenty of opportunity to buy government bonds, rather than take a risk on traditional lending. And speaking of risk, several other government policies are dramatically adding to lenders’ risk. . . . In essence, these policies have diminished the property rights of lenders. In effect, they turn every loan otherwise secured by a change of ownership in bankruptcy into the equivalent of an unsecured credit card. When banks and bondholders lose their ownership rights in bankruptcy proceedings, they lose much of their incentive to loan to anybody that needs the money. That doesn’t make lending impossible, but it certainly makes it tougher and costlier. Hitting banks particularly hard is the concept of mandatory mortgage modification. Such enforced after-the-fact contract changes make it perfectly clear to lenders that they don’t have the same rights to foreclose they thought they had when they made the loan. Bank of America (NYSE: BAC), for instance, had to set aside $8.4 billion in a mortgage modification settlement with various states. Without a credible threat of foreclosure, banks have no protection against speculators leveraging up with the banks’ money if those speculators can simply demand a sweetheart deal when their gambles don’t work out. •Chrysler was handed over to its unions, Fiat, and the U.S. and Canadian governments, while its bondholders were given a few dimes on the dollar. •General Motors was also handed over largely to its unions and the U.S. and Canadian governments, with its bondholders getting only about a 10th of the company. . . . In fact, every time Uncle Sam dictates that lenders have to adjust the terms of their loans, or that bondholders do not deserve their seat at the table when an indebted company files bankruptcy, it threatens to weaken the debt market further. As President Obama’s feckless plea to banks to lend more money underscores, no amount of jawboning will really get banks to widely open their lending spigots again. Government programs often cause unintended problems that are “fixed” by new government programs, which . . . In this case, I suggest that instead of giving politicians another hand at directing the flow of money to where they think it should go, let’s let the market do that. Let’s restore market rates rather than creating a source of free money for banks, at the expense of the rest of the economy. Let’s let banks compete, along with the rest of us, and let them fail, no matter how big, so that failure will not be subsidized by the rest of us. It was the free market, with the inherit ability to reap reward or failure in taking risk, that made the United States so successful in innovation. That track record of success was not due to government funding or programs, apart from generally appropriate efforts to help people protect their property rights (with some abuses, to be sure, from politicians and barons). Now that there is innovation fatigue in many quarters, the best solution may not be another government program, but perhaps the dismantling of programs or policies that are the source of current innovation fatigue and related barriers. “Who’s mining the shop?” This is a question that needs to be asked for every university, company, and organization capable of creating inventions. In my corporate and academic experience (am the former Corporate Patent Strategist at Kimberly-Clark Corp., and was a professor before that), numerous inventions never get the protection they deserve because nobody was there to coach the inventors, to recognize the potential for intellectual property, and to do the extra work required to develop a sound IP strategy for the work. Many inventors know almost nothing about intellectual property. Many don’t even recognize that what they have developed is an invention. This can be especially true in businesses when the invention is developed outside of a normal R&D department, such as a new business method or software tool. But even research scientists and professors may miss the patent potential of their work unless there is someone there to coach and guide them. Technology transfer offices are charged with this task in many universities, and legal departments or patent review boards have this duty in many companies, but both can miss huge opportunities unless there is someone who goes out to mine the organization for inventions. That involves reaching out to groups and individuals, educating them (often in presentations or group meetings) about intellectual property, being available for one-on-one discussions, asking questions, looking for signs of exciting developments, being an advocate and mentor, and constantly mining for IP gold. One of the many exciting experiences I had at Kimberly-Clark came after recognizing that a particular remote mill had developed some clever solutions to a few problems they were facing. After further inquiries, I learned that the mill had some very bright engineers who were solving lots of problems in clever ways. I suggested that there may be some patent opportunities coming out of that mill, and arranged a trip to spend a couple days there giving presentations and doing interviews of team members to see what they might have. I found many exciting and potentially patentable advances from their work, and ended up working with them to generate nearly a dozen invention disclosures, several of which were filed as patents. This created a lot of excitement for the mill and helped them pay more attention to the IP potential of what they were doing. As with that mill experience, part of successful mining involves helping people write up the initial invention disclosure. When people are very busy and writing disclosures doesn’t fit their job description, someone needs to be the assistant/mentor who basically writes it for them, taking away the pain of the IP process. It requires resources, but it can lead to substantial returns. Look over your organization and consider what you could achieve by applying some additional resources to help generate IP through proactive mining. It’s something we can help you with at Innovationedge. Something I personally really enjoy doing. And I consider it an important step toward overcoming innovation fatigue in some organizations. Who’s mining the shop? Great question. The North American paper industry suffers from a largely undeserved image problem. Many view it as an antiquated smokestack industry, when it has been a leader in exciting areas in technology and business practice. Fans of biofuels and green energy, for example, should know about the pioneeing efforts from the forest bioproducts industries, including many paper companies. “Green energy” from forest biomass has been the basis for economic success in pulp production for decades. A kraft mill burning black liquor is a stellar example of recovering useful energy from the byproducts of a renewable resource, coupled with smart recycling and regeneration of chemicals. The industry has also been an important part of advances in practical aspects of RFID technology, in supply chain management, in green labeling and packaging, and in many other area. In nanotechnology, papermakers have actually been dealing with nanoparticles and complex colloids for decades, producing increasingly useful and practical products built with nanotechnology employed at a massive scale. In plant genetics, crop management, and stewardship over bio-resources, the forest products industry have demonstrated world-class capabilities and results. Industry stewardship has led to more trees and forest lands in the United States than we had a century ago. Advances in plant management have led to almost miraculous results such as the ability of carefully managed plantations of eucalyptus trees in Brazil to yield trees that can be harvested after just five years – and perhaps even less in the near future. But with the proud history of innovation and leadership that I see in the forest products industry, it pains me to see how little recognition it received, and how little sense of that tradition seems to be alive in the industry today. On too many counts, the industry appears to be seized with innovation fatigue. In the new book from John Wiley and Sons, Conquering Innovation Fatigue by Jeff Lindsay, Cheryl Perkins, and Mukund Karanjikar, we identify sources of innovation fatigue factors in three primary areas: the behavior of individuals including innovators themselves and the people around them (“people fatigue”), organizational-level flaws such as flaws in vision and decision making (“organizational fatigue”), and external factors such as challenges in IP law, burdensome regulations, tax policies, and trade policies. It is easy to point fingers at management and criticize their lack of courage or willingness to invest, but we must recognize that the forest products industry have faced unusually painful burdens due to external factors which have only strengthened systematic incentives to cut back on innovation and focus on cost-cutting. There is a need for policy makers to consider the “voice of the innovator” and the unintended harmful impact that some laws and policies can have on long-term innovation. Policies are needed that put manufacturing industry on a more equal footing relative to global competitors who are generally free of the numerous burdens North American industry faces. Policies are needed that reduce the many disincentives corporations may face to be innovative and more visionary here on North American soil. Meanwhile, there are other things that North American industry can do. Innovation, whether in business models, products, or processes, must be viewed not as an expense to avoid, but as a necessity to survive. The key may not be to conduct detailed research related to the commodities now being produced, but to boldly explore adjacencies and new product spaces as MeadWestvaco did. We see some of this in the biofuels area, such as creative approaches to integrated biorefineries using technologies suited for local biomass and other local resources and markets. We see this in many of the packaging innovations created by innovators in paper-related companies. We see this in the example of companies like Kimberly-Clark that transformed themselves from commodity makers to producers of world-class high-value consumer products rich with innovation and intellectual property. The most exciting innovations of the future will come at the intersection of disciplines. Building the right relationships and networks across companies, innovators, and institutions will be needed to be aware of the possibilities and to seize them. The technologies we are using today and the know-how we have developed in the forest products industries may be the foundation for rich innovations in nanotechnology, health care, electronics, and various emerging fields, if only we have the courage to explore wisely, with talented minds empowered and motivated to find the paths forward, unhindered by the chains of innovation fatigue. This post is related to a longer article written for Tappi360 magazine, Dec. 2009. One of my favorite inventors from my days at Kimberly-Clark, Fung-jou Chen, recently visited Taiwan and shared with me the news of an exciting innovation hailing from that innovation-rich island. Thin films have been used to create flexible speakers that can deliver reasonable sound quality from an inexpensive, flexible sheet. The sound quality is worse than conventional speakers, but offers new dimensions of convenience, ease of use and installation, small volume requirements, and low cost–a classic formula for disruptive innovation. When this becomes fully commercialized, there will be opportunities to add sound to places and ennvironments where it was too costly or difficult before. The ability for many objects and surfaces to become more interesting, useful, and interactive may increase and enable a variety of new business models to be considered. Disruptive innovations of this kind can be the raw materials for further waves of innovation. Stay tuned! Further information is available at Fast Company. The technology was developed by ITRI, the Industrial Technology Research Institute, Taiwan’s largest and one of the world’s leading high-tech research and development institutions. See their press release on the breakthrough FleXpeaker, which was given a prestigious award by the Wall Street Journal for this development. Below is a Youtube video showing a FleXpeaker in action. 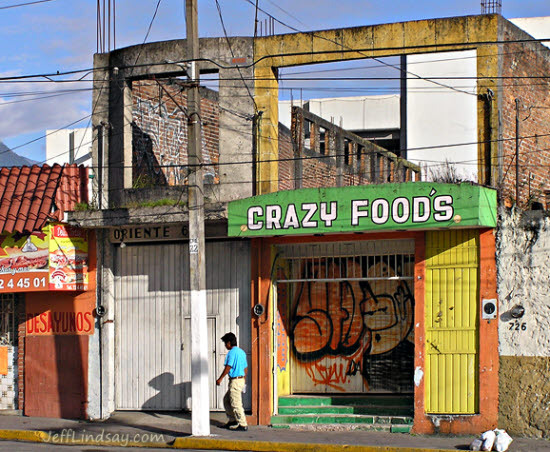 Crazy Foods, an intriguing spot I photographed in a small and actually very innovative town in Veracruz State, Mexico, represents the wild and crazy ideas of prospective innovators that, like most innovative concepts, end up in failure. Brilliant ideas deemed crazy by others often really are, and those that have potential for crazy success can face numerous innovation barriers, like those we document in Conquering Innovation Fatigue. The way of the innovator is often hard, but there are shortcuts and work-arounds to many of the barriers. Innovation success can be much more likely, both at the personal and corporate levels, if you know what others have learned and understand how to deal with the threats that will surely come your way. May 2010 be a great year for crazy and successful innovation!